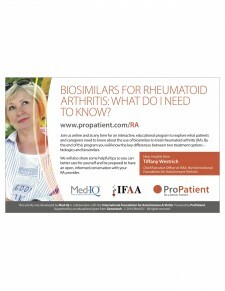 Hillsborough, NC, December 15, 2016	(Newswire.com) - ​​Several organizations have partnered together to develop a unique and interactive online resource about the use of biosimilars to treat rheumatoid arthritis (RA) for patients and caregivers. ProPatient, a provider of interactive online patient education tools, has teamed up with Med-IQ, one of the most award-winning accredited CME providers in the nation, and the IFAA, an award-winning international foundation for autoimmune & autoinflammatory diseases with arthritis as a major component. 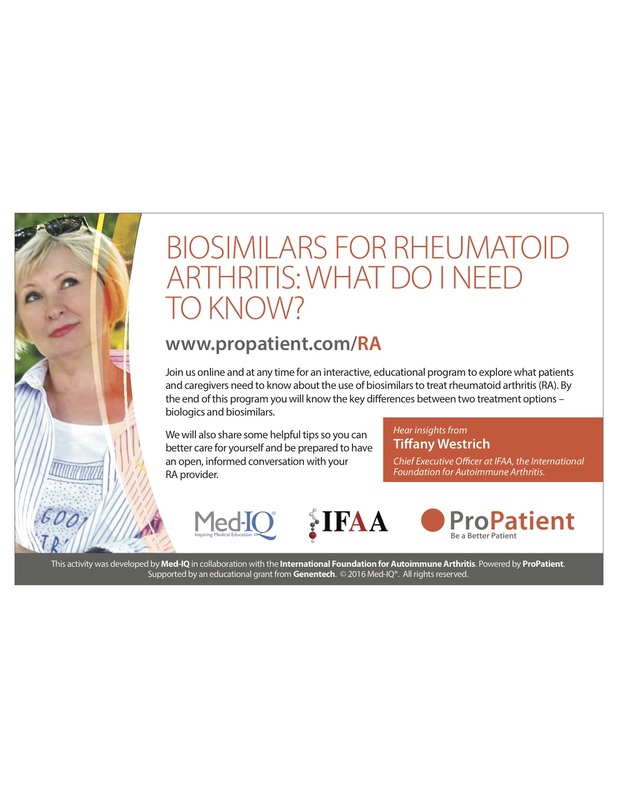 The program, entitled “Biosimilars For Rheumatoid Arthritis: What Do I Need To Know?” informs participants of the key differences between biologics and biosimilars. It also provides helpful tips for patients preparing to have an open and educated conversation with their RA provider. This program creates a highly interactive experience. It's like a simulated conversation with a virtual doctor. Actual doctor visits are rarely long enough to get all your questions answered, so this type of program can help fill in the gaps. RA is the most common type of autoimmune arthritis. It is triggered by a faulty immune system (the body’s defense system) and can affect not only joints but also connective tissues and organs. Treatments have improved greatly and help many of those affected. For most people with RA, early treatment can control joint pain and swelling, and lessen joint damage. Biosimilars, often used as a treatment option for RA, differ from generics – in complexity, in the manufacturing processes and in the data needed to demonstrate similarity for approval. “This unique project uses a continued education (CE) video format to answer the questions patients most want to understand about biosimilars and how new medications will affect their treatment regimen,” said Westrich-Robertson.